These delicious petits fours are made with moist chocolate cake, decadent chocolate truffle cream and vanilla buttercream. Commemorate the occasion in good taste with our scrumptious new petits fours. We have teamed up our melt in your mouth shortbread cookies, moist chocolate cake, decadent chocolate truffle cream and vanilla buttercream to create these truly smart confections. Each petit four is enrobed in luscious dark chocolate and adorned with golden chocolate tassels. 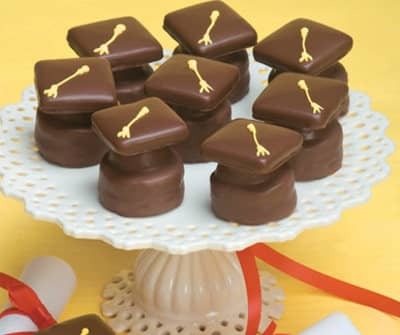 12 confections are presented in a gift box and tied with a beautiful bow for your deserving graduate.